How Is GDPR Affecting Publisher and Blogger Monetization? Now that the official GDPR compliance deadline has passed, I think it’s fair to say that publishers and content creators of all shapes and sizes have a lot of questions about the impact they should be seeing or expecting on their websites. GDPR regulations have not been easy for anyone to navigate. For businesses that make their living from monetizing online content, this holds particularly true; as many have wondered what kind of effect this entire set of European laws could have on, not only their site(s), but the entire industry as a whole as well. Below, I’ll review a couple of the top questions I’ve seen from across the web about the impact of GDPR, expectations from publishers, and what we are seeing on the thousands and thousands of sites using our platform. Included Below: The impact of GDPR on ad rates and monetization for the US, EU, and rest of the world. Are most publishers and bloggers in compliance with GDPR? That’s a loaded question. First, that is obviously impossible to answer. However, statistically speaking, it looks like a lot of websites aren’t. In fact, many that have tried to comply with EU law seem to have disobeyed many of the general GDPR guidelines. 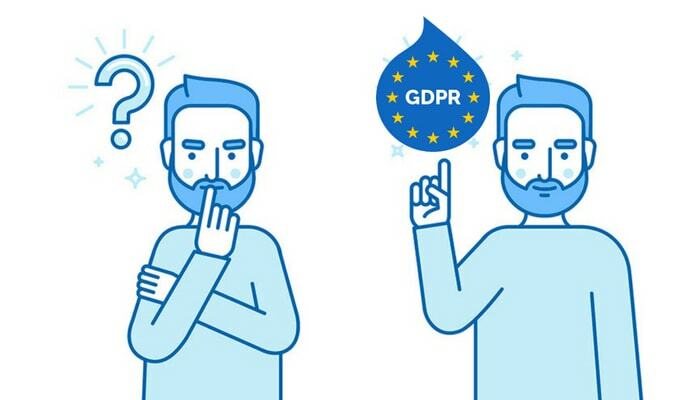 I walked through basic instructions on how to move towards compliance with GDPR here (the article was specific to publishers and content creators). According to how most everyone is interpreting GDPR guidelines, this isn’t good enough to warrant consent. 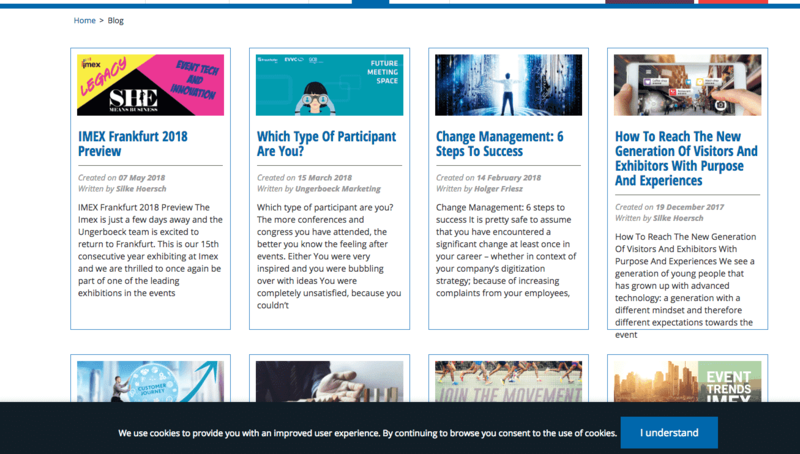 To grossly over-simplify, if you are using an approved or industry-recognized CMP (consent management platform), you are likely on the right path. Ezoic offers one for free to publishers and content creators. This is what allows publishers to manage actual EU visitor consent for things like ads, tracking, forms, and more. It typically looks like a pop-up when EU visitors land on the site. I can ignore GDPR, right? A common misconception among non-EU website owners is that GDPR isn’t relevant to them (perhaps because they reside outside the EU or target a non-EU audience). If any EU visitors come to your website or blog, GDPR regulations apply. This means that EU visitors must consent to any personally identifiable information (PII) that is collected or used on the on the site (user IP addresses are a common one). For publishers and content creators, this affects the way you serve these visitors ads. If EU visitors do not consent to have PII used on your site, you can still serve them ads; however, they cannot be “personalized” ads. This means many of the remarketing/retargeting ads that advertisers traditionally display on your site programmatically (through Google AdSense, Google AdX, or another ad provider) cannot be used on these visitors. All of these ad providers — including those mentioned above — provide other forms of ads you can show these visitors; however, this must be configured properly for EU visitors to comply with GDPR law. This is really why I mentioned a CMP above; as a good CMP for publishers should allow them to manage consent and ad serving permissions for EU visitors. 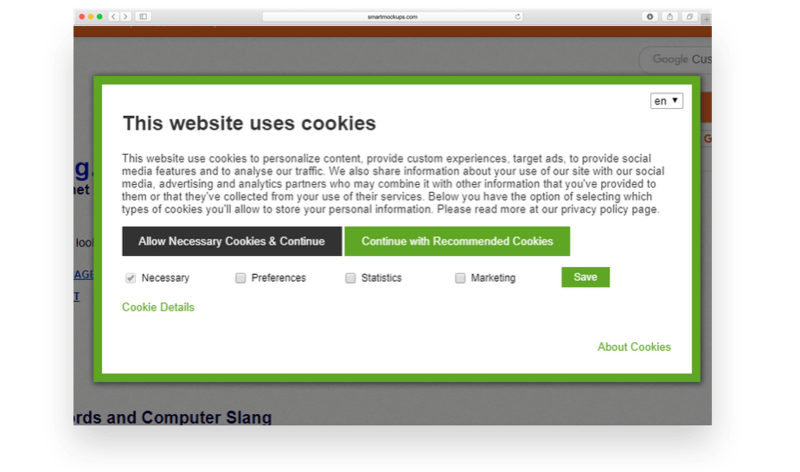 For example: the EU visitor consents to cookies for marketing and then has personalized ads are served. If consent is not given, then the CMP automatically changes the site so that non-personalized ads are served. This is a fundamental step towards GDPR compliance. How is GDPR affecting ad rates? Overall, has GDPR affected website earnings? That effect will largely depend on the location of your visitors. 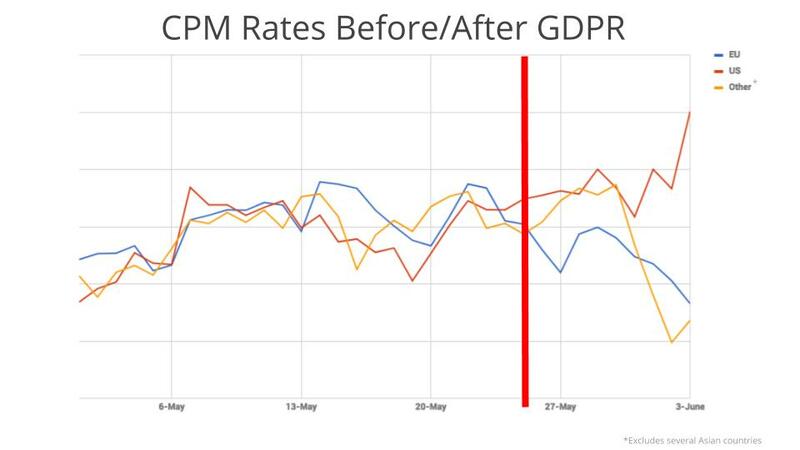 Early GDPR data suggest that CPM rates have now shifted for different geo-locations. Whether this has a positive, neutral, or negative impact on a certain site will depend solely on the types of visitors that site attracts. More specifically, ad rates have gone up when visitors are coming from some locations and gone down when targeting others. How is GDPR affecting ad rates in the United States? An interesting observation we’ve seen in the online Ad Revenue Index is that rates have been rising all throughout 2018. What’s even more interesting is that a record high was recorded in the U.S. on the day after GDPR went into effect. 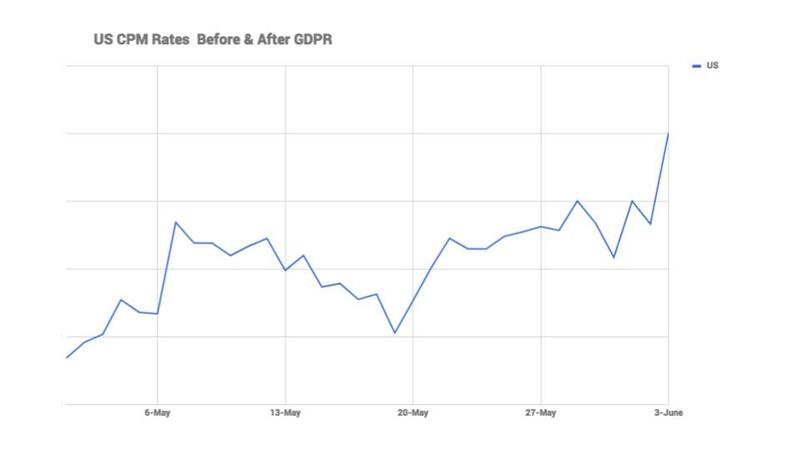 Ad rates in the U.S. have risen about 10% since the GDPR compliance deadline on May 25th. 1.) Advertisers have pulled inventory from the EU and are investing in the U.S. more. It may even be a bit of both. And honestly, it could be something else too. It is too really early to tell. 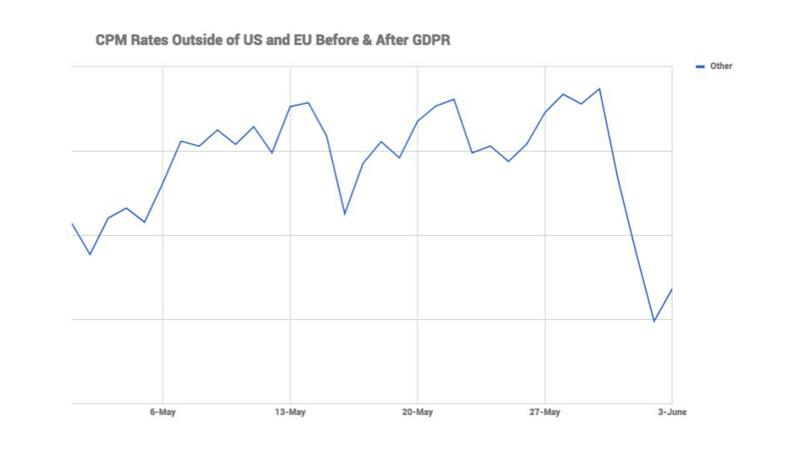 Nevertheless, early data shows that GDPR has improved U.S. ad rates. However, at this juncture, it is impossible to project how things may continue to unfold for the rest of the year. How is GDPR affecting publisher earnings and ad rates in the EU? While US ad rates seem to be on the rise, post-GDRP, EU ad rates seem to be on the decline. This was predicted in many industry circles. Again, it is still too early to make any strong statements about why we are seeing some of these shifts, and if they will be something we continue to see trending long-term, but we are indeed seeing ad rates decline in the EU. How is GDPR affecting publisher monetization in the rest of the world? So… ad rates in the US are going up post-GDPR. And, ad rates in the EU are going down post-GDPR. 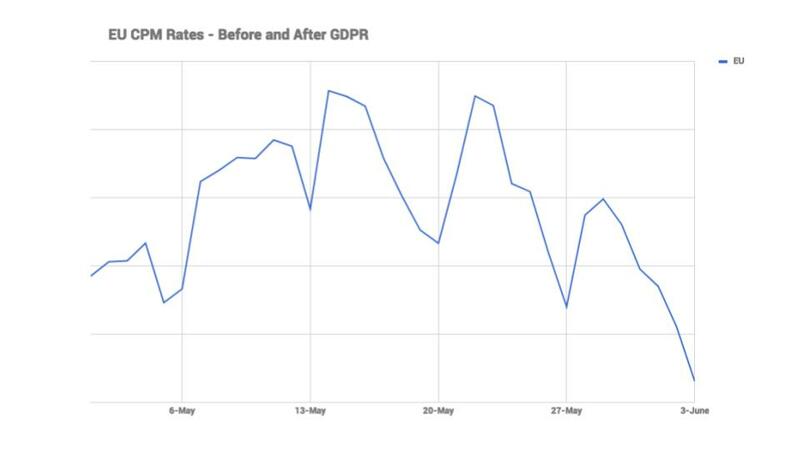 Immediately following the GDPR deadline, ad rates outside of the US and EU looked to be steady (and maybe even rising). However, as time has progressed, things look to be shifting towards a greater overall decline in cumulative ad rates. This data is missing some of the larger Asian countries, but it does speak to an interesting trend. It is still early to decipher exactly why we are seeing ad rates outside the US and EU decline as steeply as EU ad rates. Non-EU countries, we would initially think, should not be affected negatively by EU regulations; however, it just goes to show how interconnected this entire ecosystem really is. This may be due to advertiser behavior or could be a butterfly effect from other changes related to how ecosystem stakeholders — advertisers and platforms like Google — are reacting to the new GDPR regulations. What does the early GDPR data tell publishers and content creators? The early data tells us that ad earnings are affected. It is hard to make a stronger statement than that. Depending on where your visitors are located, this might positively impact you, or negatively impact you. More likely, it does not affect you at all (consider it all a wash). This is the EU. These website visitors must be treated according to GDPR guidelines. No one knows how the ecosystem is going to respond long-term. There may be some kneejerk reactions from advertisers causing a few overcorrections in the marketplace that will even out soon. This is a data-driven marketplace. Succeeding as a publisher without the power of data is going to get harder and harder. Being able to make sense of this data can be a huge advantage. Understanding your visitors — and the role they play in your traffic and revenue — has never been more important. Does the average blogger, publisher, or content creators need to be GDPR compliant? Has GDPR affected global ad rates? It depends. And, it is impossible to project how things will unfold over the course of the next few months. Leave them below and I’ll do my best to provide answers (note: I can’t provide legal advice or any clarifications on GDPR law; nor do you want me to). Excellent post on GDRP and Blogger Monetization..! !